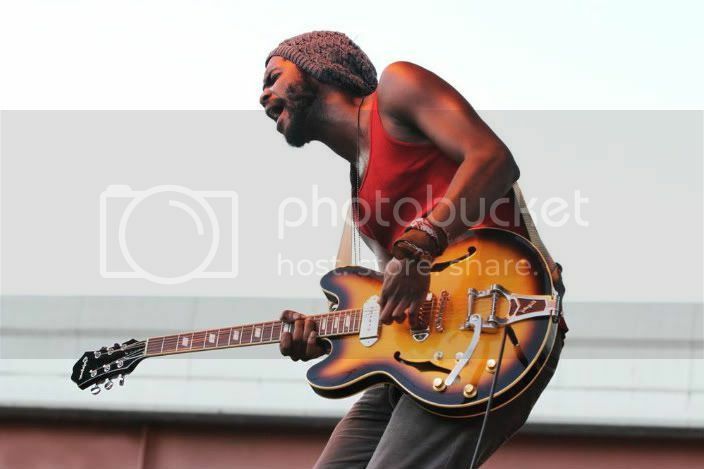 We have new video from the amazing Gary Clark Jr., once again great footage from his fantastic set at Dave Matthews Band's Chicago Caravan stop. "When My Train Pulls In" can be found in solo acoustic form on Clark's Bright Lights EP. This version features Clark and his touring band and it is electric in every sense of the word. It's a great song and works in the ruminative, singer/songwriter treatment its given on the EP but this scorching six-plus minute performance boasts a blazing guitar solo to close the song. He's such a creative, fiery player. There are lots of guys with flash and tecnique and plenty with style, and Clark stands above a great many of them. He actually plays two solos in this performance and they're very different from one another, demonstrating that creativity and versatility. The first is restrained, proving he doesn't have to shred to burn; the second solo is a soaring excursion bolstered by strong playing by his backing band. This performance lets you see an awful lot of what makes Clark so special. He's a great vocalist, frontman, guitarist, and songwriter. Again, there are lots of artists who can do some of those things but not many who have them all in abundance. He is one of them. I like Dave Matthews Band a lot and I'm pretty damn sure having now seen several clips from this show that if I'd have gone, it would have been to see Dave but I would have come home talking about Gary. I bet it happened to more than one person who actually did attend. Loyal readers have noted several of us at BlindedBySound have been blown away by Clark's talents and we've written extensively about him. We weren't the first to discover him and we won't be the last, but we're as passionately TeamGary as you'll find anywhere and can't wait for the full-length debut for Warner Bros. to hit streets this year, perhaps as early as this spring! We'll continue to preach the gospel of Gary so do yourselves a favor and immediately purchase or download Bright Lights. You will thank us.